The less space you have, the smarter you have to be with it. Start with these simple ideas. 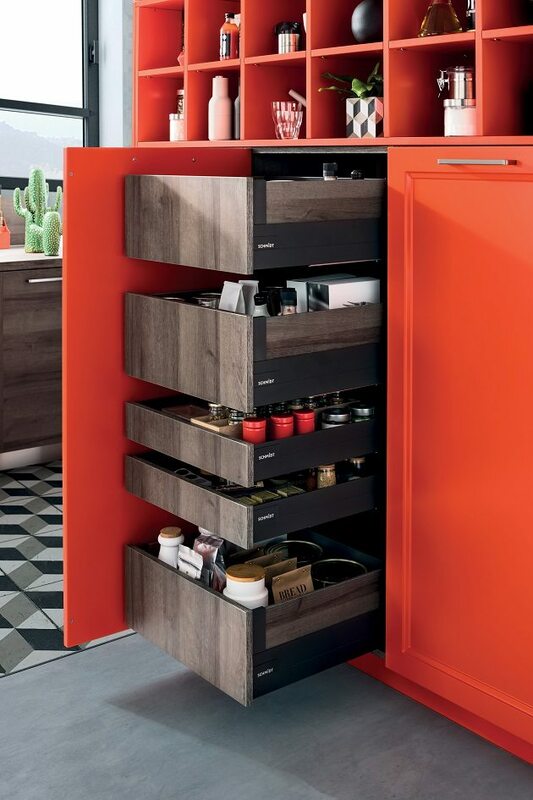 Pull-out drawers mean you can see right inside your cupboards without having to crouch down. Steal Schmidt Kitchen‘s style and hide multiple drawers behind a single panel to minimise horizontal lines and create a clean aesthetic. These drawers from Schmidt’s Groove collection are pictured in a tobacco finish but are available in 14 other shades. They’re teamed with a lacquered MDF panel (available in 25 colours) from its Bolero range. Schmidt kitchens start from £10,000. A corner unit with a full extension carousel like this one from Mobalpa’s iPractis range makes use of even the most awkward of spaces. It also takes the stress out of food preparation – no more stretching into the back of a deep cupboard. Mobalpa kitchens start at £8,000. Thinking vertically is a brilliantly simple way to create easy-access space. This corner larder from LochAnna makes excellent use of vertical space and maximises an awkward corner. It’s featured here in the Mala kitchen in Gloss Dust Grey. Kitchens at LochAnna start from £5.000. If the space between your worktop and wall units isn’t being used, you’re missing a trick. 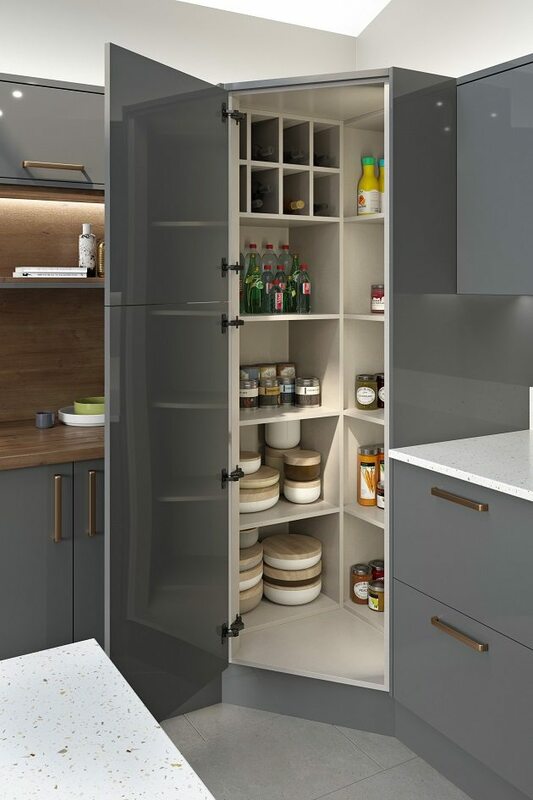 Insert a hanging rail to save cupboard space and keep essential utensils close to hand. 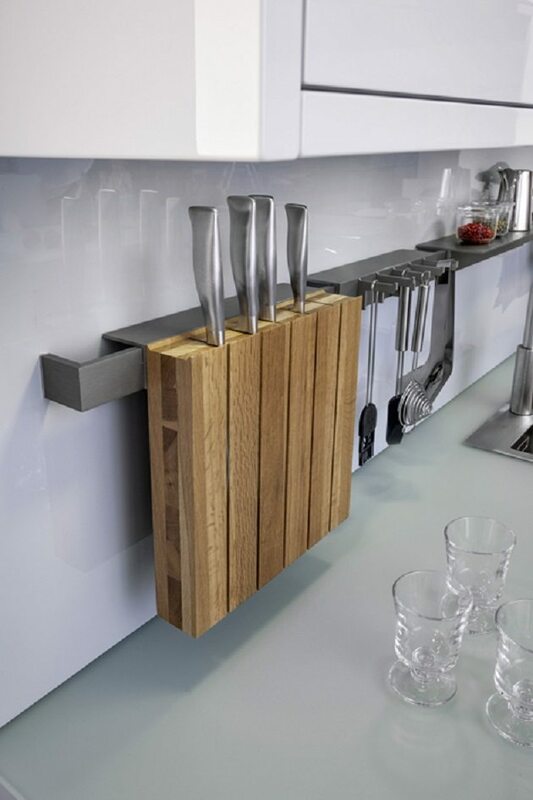 Suspended from a stainless steel rail, Modo from Kitchens International is a 30cm-long lacquered oak knife holder with storage for five knives. Priced from around £485, it includes the rail, the rack and a knife set. MosaiQ by Rational (priced from £175) is a wall-hanging storage system that sits neatly in the space between the worktop and wall units. Made from stainless steel with a graphite finish, the system is available with LED lights and comes in rail lengths up to 180cm. Choose from a selection of storage options including a knife block, shelves, hooks and kitchen roll holders that all hang from the rail. 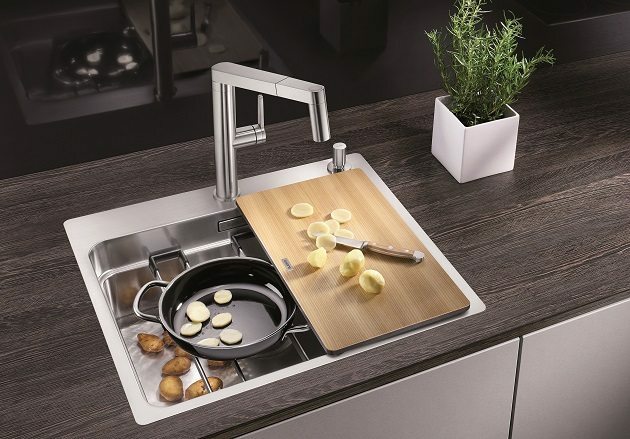 If you’re struggling for space, you need a kitchen sink that works harder than the rest. Meet Etagon 500-U by Blanco, designed to help with all kinds of kitchen tasks. Use it as a pot rest or fit a glass or ash chopping board to create space to prepare vegetables. When it’s time to serve, the non-slip runners can be used as a trivet. Etagon 500-U is available at Sink World for £439. 6. What about waste management? Most kitchen ranges come with the option to hide rubbish so that you don’t have to have a freestanding bin in the open. However, if you’re refreshing existing cabinets, storage mechanisms are sold separately by the likes of Häfele. Installing a bin under the sink is a good way to make use of otherwise dead space. 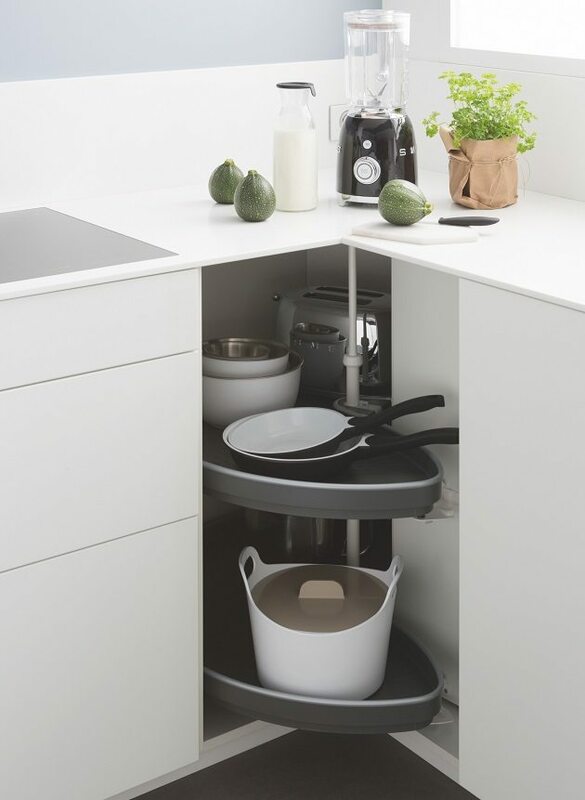 Another option is to consider a system specifically designed for a corner unit, maximising a hard-to-reach space under the worktop. 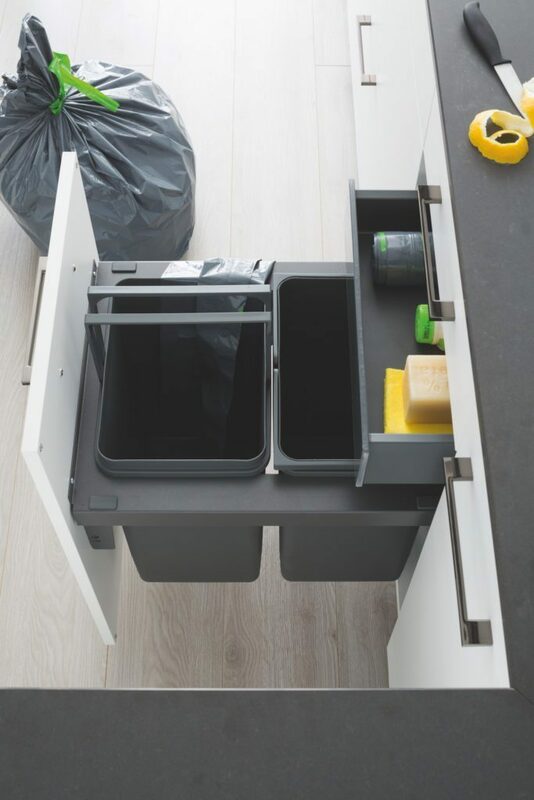 This bin from Mobalpa’s iPractis range allows you to separate out waste and recycling with ease thanks to a simple pull-out drawer. Mobalpa kitchens start at £8,000. When space is at a premium, every inch counts. 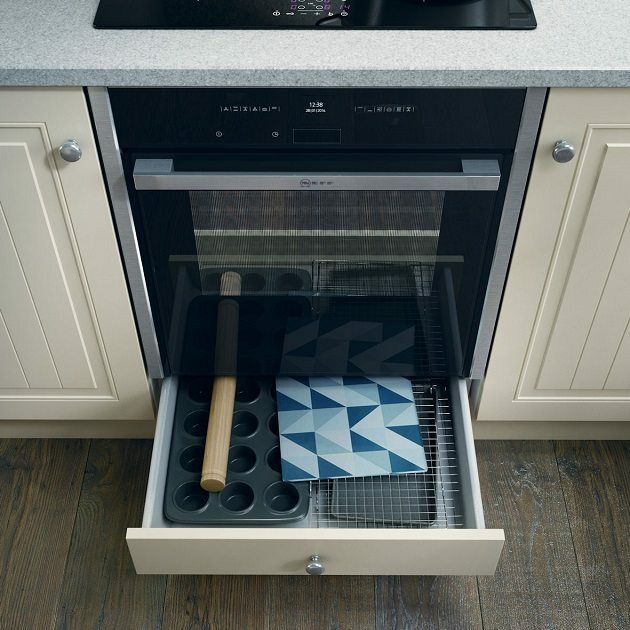 This 600mm built-under oven housing unit from Benchmarx Kitchens comes with a shallow storage drawer that’s perfect for baking trays and cooling racks. Shown in the Warwick ivory tongue and groove collection, prices for this unit start from around £125. Smaller spaces need smarter furniture that can be used for a variety of occasions. 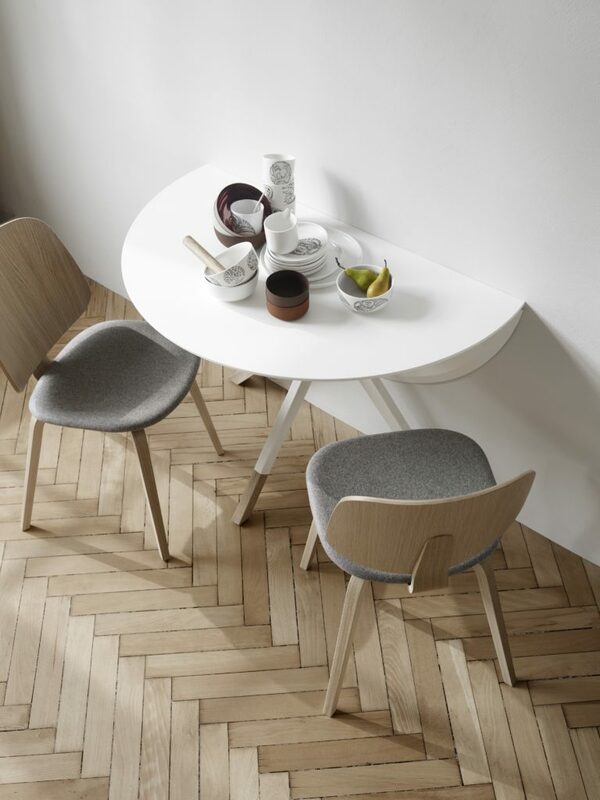 BoConcept’s Billund table (£799 in matt white) is designed to be flexible and functional. It can be used as a dining table for get-togethers, as a console table or smaller dining table for one or two people. 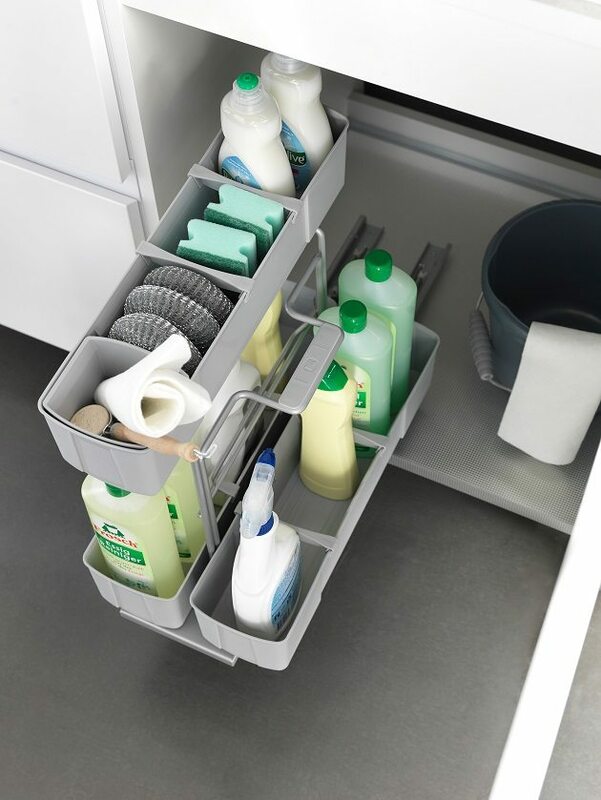 For your small kitchen to work efficiently, you need to get organised. Tame clutter with drawer organisers, which are widely available from just a few pounds. Want a more tailored solution? 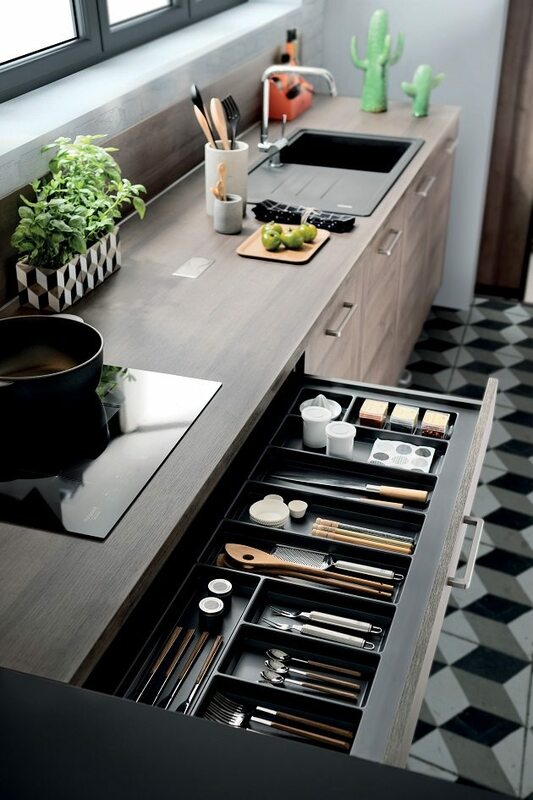 Source a kitchen company that can customise inserts and trays to keep utensils in their rightful place. An excellent example is this one from Schmidt. Cleaning materials are best stashed out of sight but easy to access. The dead space under the sink is a popular place and perfect for Rational’s portable Cleaning Agent, which slides in and out on runners. Prices for a kitchen by Rational start from £10,000. Pocket doors slide away into the wall so they don’t impinge on valuable square inches when open. 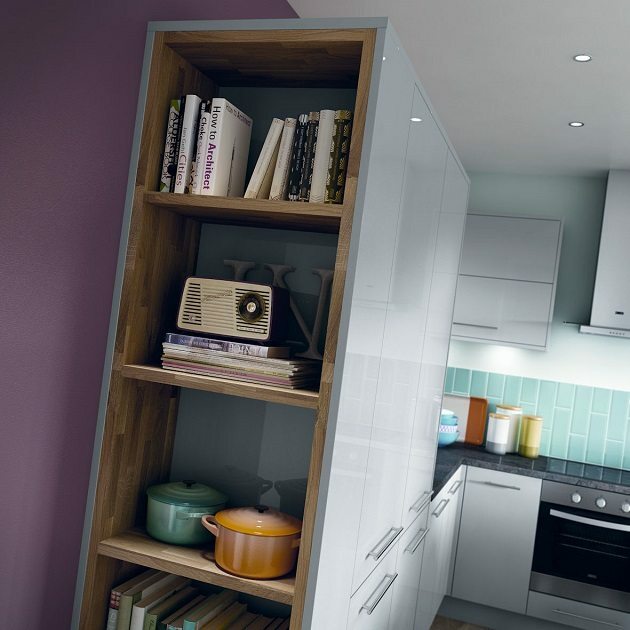 Kitchen International often uses pockets to hide essentials such as washing machines and tumble dryers – and you can close the doors while the appliances are in use, shutting out any noise. Kitchen International kitchens start at £15,000. Appliances that perform more than one function, such as combination oven/microwaves, are a valuable addition to a small kitchen. Compact and slimline appliances are also worth their weight in gold: try the likes of CDA, Neff and Bosch for ideas. You could also consider a space-saving modular system. Genesi is a great example, comprising a series of 70cm-wide steel columns available in four configurations: a built-in single oven with two drawer compartments, a built-in double oven with one drawer compartment, a column that can hold a dishwasher with one drawer compartment, and a column that can hold a fridge. 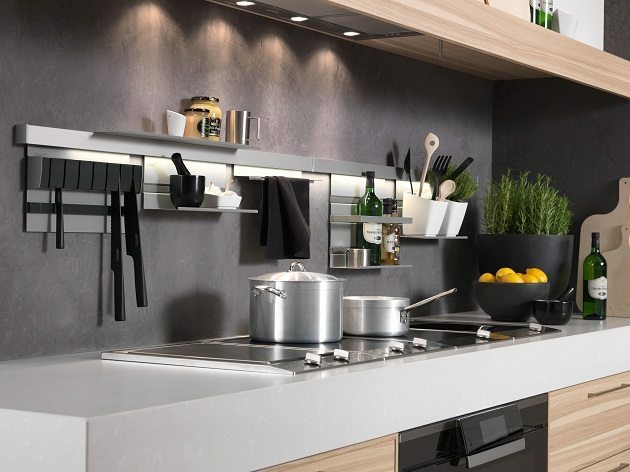 The Genesi modular system by Italian manufacturer Steel is available at Bradshaw Luxury from around £2,440. Small appliances such as coffee machines, food processors and blenders can clutter up worktops. Do you really need them? If you do, make sure you buy the smallest models available without compromising on functionality. And as with larger items, look for appliances that serve more than one function. 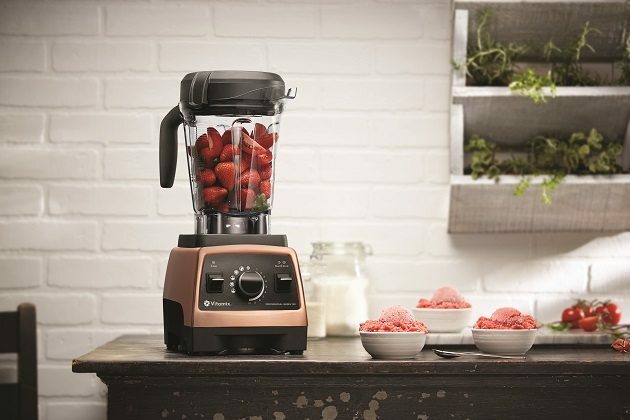 For example, the Vitamix Professional Series 750 blender features five pre-programmed settings to make everything from hot soups to frozen desserts. It’s priced from £650. In a small space, we often forget to think upwards, but tall or wall-to-ceiling units can house an amazing amount of stuff. Add open shelving to the end of a run of cabinets and, if your small kitchen is part of a dining or living room, the shelves can double up as display space. Here, Benchmarx Kitchens has worked sleek shelving into its Eton Gloss Light Grey kitchen, priced from £110.75 for a 100cm base unit. 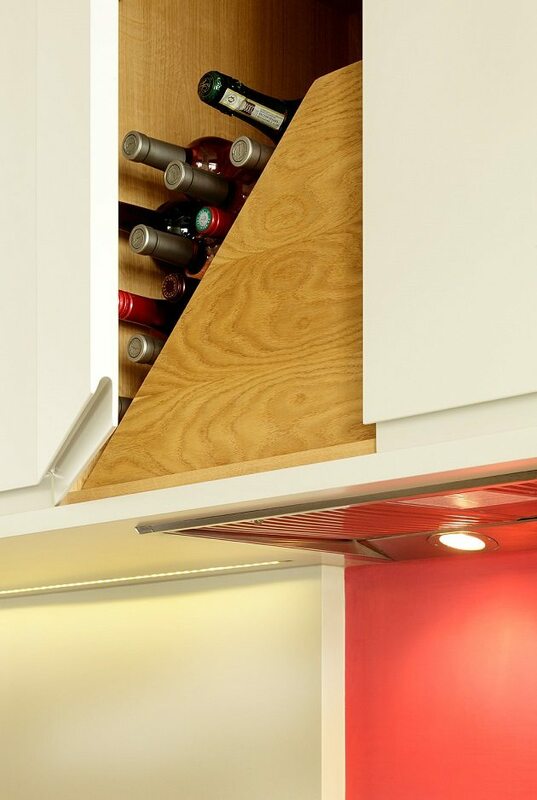 Kitchen designer Cue & Co of London took full advantage of this awkward nook above an extractor hood by converting it into a small space to store wine. Kitchens at Cue & Co of London start at £30,000.